We are really excited to have this year’s annual meeting in Iowa City! This will be a wonderful opportunity to see all the book arts activities Iowa City has to offer and a chance to meet even more Midwest members doing interesting things. Registration is now open for the workshop portion of the weekend! (see below) Some events on this schedule are yet to be announced due to a few details that are still being worked out. An updated version of the schedule will be posted here and sent through email. Thank you for your patience! WORKSHOP DETAILS: To register for one of the following workshops during our annual meeting weekend, please send an email to Mary Uthuppuru, Programs Chair at mary@springleafpress.com. Once you send an email, a confirmation email will be sent with more workshop information to follow. Course Description: The abecedarian is a poetic form whose lines or stanzas are dictated by the letters of the alphabet. Abecedarians are commonly used as a mnemonic device for teaching children the alphabet, (i.e. A is for apple, B is for book…), but other examples can be found in religious texts and poetry dating from ancient times to the present. 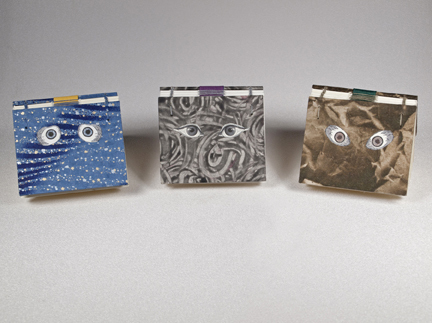 Illustrated abecedarians have become a popular form for artists’ books because they provide a playful yet contained structure for content that has endless possibilities. In the first half of the workshop, we will look at a variety of abecedarians and get inspired. Each participant will then create their own abecedarian, with the option to illustrate it. In the second half of the workshop, we will bind our abecedarians using a unique non-adhesive “monster” binding. There will be an opportunity to share our work with one another at the end of the class. Instructor Bio: Bexx is a bookbinder and book conservator specializing in custom binding, miniature books, fine binding, and book conservation. She holds a Certificate in Bookbinding from the North Bennet Street School and a Master’s of Library Science from Simmons College. Before moving to Iowa City this past December, Bexx spent nearly a decade living in the Boston area, where she worked in a variety of libraries and conservation labs, including Harvard and MIT. She has a passion for miniature books, typography, and vegan baking. Course Description: There are many versions of the Crossed Structure binding. This one is specifically designed to allow the book to expand later. This expandable leather book structure lies flat when opened. 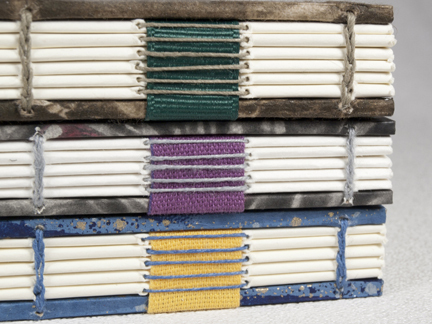 The seven inch square book is sewn on straps woven through a double cover. 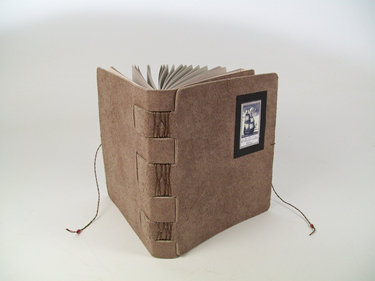 You will construct this book as an album, including pages with envelopes, enclosures, and encapsulations. You will also incorporate map folds to accommodate oversize additions to the album. Peggy will provide 30 examples of album pages, from very basic to complex, for participants to look at. Bring along any small flat objects and one or two oversized foldable items that you would like to include in your album. Students should bring a basic binding kit and ephemera to go into the book. Instructor Bio: Peggy graduated from the University of Wyoming with a double degree in Art and Education. Since then, she has continued her studies in painting, printing and the book arts. She has taught book art workshops in Oregon, Colorado, Wyoming, Connecticut and Iowa, and has studied with leading book artists across the nation. Locally, Peggy is a busy artist. In addition to her own work, she finds time to teach at the Des Moines Art Center. She also teaches in the public schools as a visiting artist, working with k-12 students. Other opportunities have allowed her to teach at University of Northern Iowa, Simpson College, and Drake University. Occasionally, Peggy speaks to local groups about her work and the book arts, and conducts seminars for graphic design and art director organizations. Peggy was instrumental in the founding of The Prairie Book Collaborative, a group dedicated to the book in all its forms. 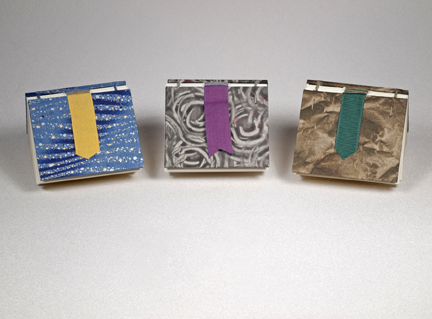 Peggy’s work is in public and private collections nationally and internationally. She frequently exhibits her work in local and national exhibitions. To learn more about Peggy and her work, go to www.wavelandstudio.com. I’ve started an inspiration board on Pinterest for my Miniature Monster Abecedarian workshop. Come check it out and get inspired with picture of adorable monsters, illustration and calligraphy tutorials, examples of abecedarain artists’ books, etc.